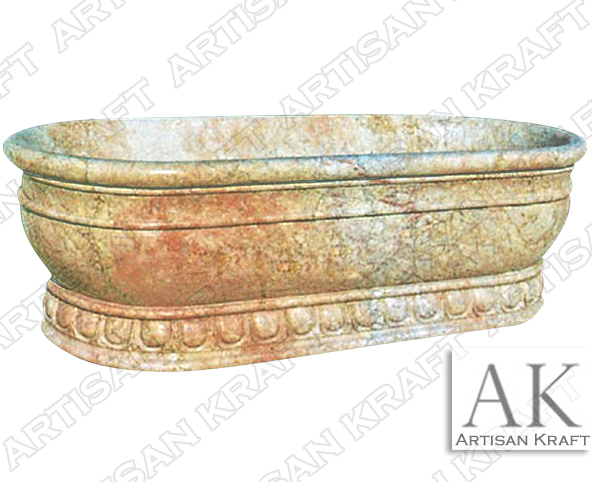 Classic form and design combine in this beautifully traditional soaking pedestal tub. It sits on the raised trim that is detailed with carvings. Call in for pricing. The overflow drain costs additional. This design is distinctly different from our slipper tubs. The pedestal and the ends of the bathtub are its distinguishing features. The Beige marble that was used with the veining give this freestanding bath its original stylings. This design looks great in white marble or Carrara as well.